Car club firm Streetcar has this week launched the UK's first electric car hire scheme, offering Londoners the chance to hire a plug-in hybrid version of Toyota's popular Prius. The modified version of the hybrid car is provided by UK firm Amberjac Projects and features a new lithium ion phosphate battery that can be charged from the mains, allowing the car to travel up to 30 miles without using the conventional engine. According to reports from the Evening Standard, the Amberjac Prius will be available for Streetcar members to hire from £5.95 an hour. Speaking to BusinessGreen.com, Streetcar's co-founder Brett Akker said the company's 58,000 car club members would be the first people in Europe to be able to hire a car with plug-in hybrid technology. He added that if the trial, which is backed by Camden Council and Transport for London, proves popular the company will aim to roll out more plug-in hybrids across the capital. 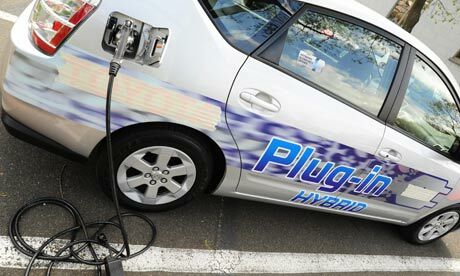 "Plug-in hybrids have a lot of potential for car clubs," he said. "The Amberjac has a 30 mile range using the battery, which covers around two thirds of our members' journeys, but it can then also be used for any longer journeys. " The news follows the launch last week of a new initiative that will see some of the capital's largest fleet operators work with City Hall to accelerate the rollout of electric commercial vehicles. The group, which includes delivery firms DHL, TNT and UPS, as well as supermarkets M&S and Sainsbury's, pledged to increase their electric vehicle fleets and work with the mayor's office on plans to roll out 25,000 charging points across the city by 2015. "Not only do electric vehicles save a large sum off fuel bills, helping businesses to remain lean in tough economic times, they are also great for London's environment," said Mayor Boris Johnson. "We are now going to work hand in hand with fleet owners to accelerate the take-up of electric vehicles, which are available to buy right now."